One of the simplest and most refreshing healthy summer snacks are frozen grapes. But recently I tried a new twist on frozen grapes, grape snowmen. It couldn't be easier! Please make sure any kiddos that try this snack are older, so the frozen grapes don't present a choking hazard! This is my new go-to salad for a quick and delicious side dish. In fact, if your weekend plans include a potluck, grill out or picnic, you must try this salad. The best part of this crisp and fresh salad is that it takes less than 10 minutes to make. Really. In a medium bowl, combine the corn, zucchini, tomatoes, basil, salt, pepper and olive oil. Toss well to combine. Serve and drizzle with a touch of balsamic. Serves 4, but can easily be doubled for a larger group. As the only female in our home, there aren’t a whole lot of pink things floating around the house. Pink isn’t even one of my favorite colors (despite the fact that G insists that as a girl, I am required to have pink or purple as my favorite color), in fact, it is noticeably absent in most rooms, especially when compared to my friends with daughters. One of my good friends has a sweet little girl. Her older brother is good friends with R, and recently she tagged along with her big brother for a play date. I was in heaven: I was able to do all sorts of girlie-girl play, stickers, coloring (my boys like to draw, but coloring, not so much) and the like. Inspired by having a girl with which to create in the kitchen, I had her help me make something new: pink pickles. Not actually cucumbers, these pickles are made out of radishes. 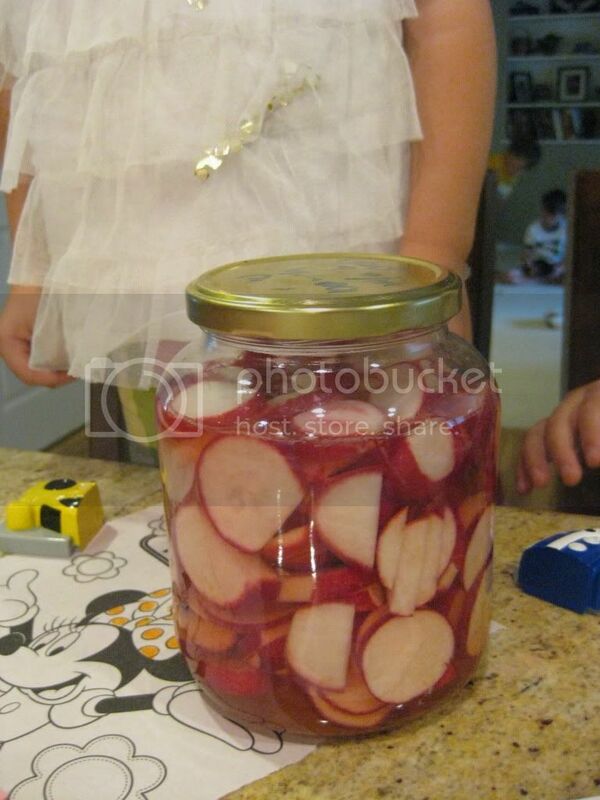 We cleaned up some radishes, sliced them and added them to a jar I had on hand, and mixed them with the simple pickling recipe below. Oh. my. goodness. These pickled radishes exceeded any expectation of good. They are crazy good. I know, it's a tough sell: picked radishes=crazy good? It's true. I dare you to try them! 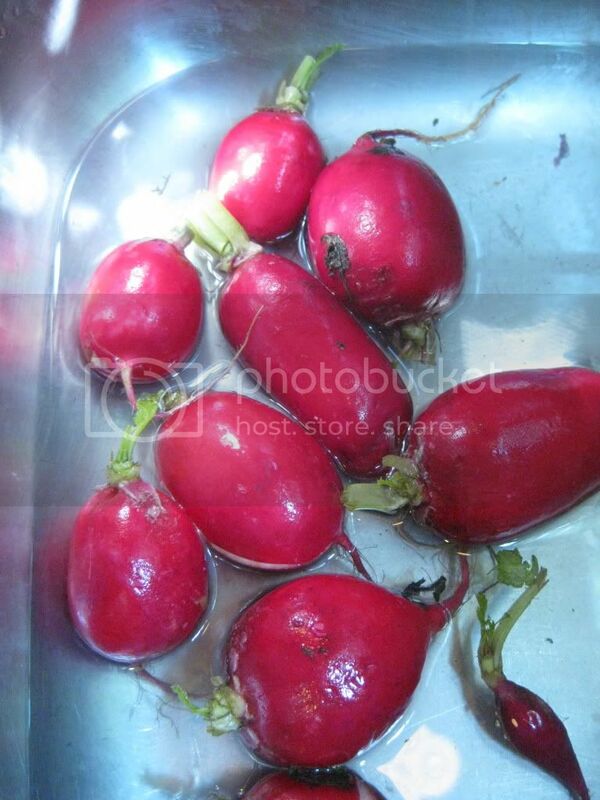 Rinse and dry the radishes. Slice them into quarter-inch slices. Place them into a jar or bowl. In a microwave safe dish or glass pyrex measuring cup, pour the vinegar and water together. Microwave on high for 1 minute. Add the salt and sugar, and stir until they are dissolved. Pour over the radishes. Stir. Cover and refrigerate, at least one hour, or until they begin to turn pink. Eat. Oooh and ahhh. Repeat. Makes about 2-3 cups pickled radish. Will keep in your refrigerator for 3-4 weeks, but ours were gone in mere days. We ate dinner on the back patio last night. It's a beautiful thing to leave the confines of our kitchen and house and eat amongst nature. Bring on al fresco dining season! Season the chicken with salt and pepper and grill until cooked through and no longer pink inside. (Alternatively this salad is a great use for leftover grilled or even rotisserie chicken). Divide the greens among 4 bowls. Sprinkle each salad with the corn and tomato. Add the shredded cheese to each bowl. Slice the avocado and sprinkle with a bit of lime juice to keep it from browning too quickly. Place the avocado on top of each salad. Drizzle with the Chipotle Ranch Dressing. Ahh...a great salad for dining al fresco! One of the easiest ways to save money, reduce the "gunk" in your food, avoid gluten (yes, many store-bought ranch mix packs contain gluten) and save yourself an extra trip to the grocery store, is to have a recipe or two up your sleeve to use in a pinch. We already use our Homemade Taco Mix regularly. But now with the season of salads upon us, we've been whipping up both regular Ranch Dressing and Chipotle Ranch Dressing too! Here is the easy recipe, all you do is add chipotle pepper powder and paprika to the base Ranch Dressing mix to spice it up a bit. Mix with Greek Yogurt and you have a super-healthy dressing that is just as rich and creamy as the original. Combine all ingredients except yogurt and stir well. Add to the yogurt and mix well. Tastes best if allowed to sit 1 hour before using. *To make Chipotle Ranch Dressing: add 1/8 teaspoon ground chipotle pepper powder and 1/4 teaspoon paprika to the mix. The finished product on a wonderful summer salad. Side note: Dry mix (everything but the yogurt) can be mixed and stored in a sealed container for future use. Additionally, you can make a double, triple or quadruple batch and store it in a container. To use with the yogurt, use a scant 2 tablespoons of the mix per 1 cup of yogurt. 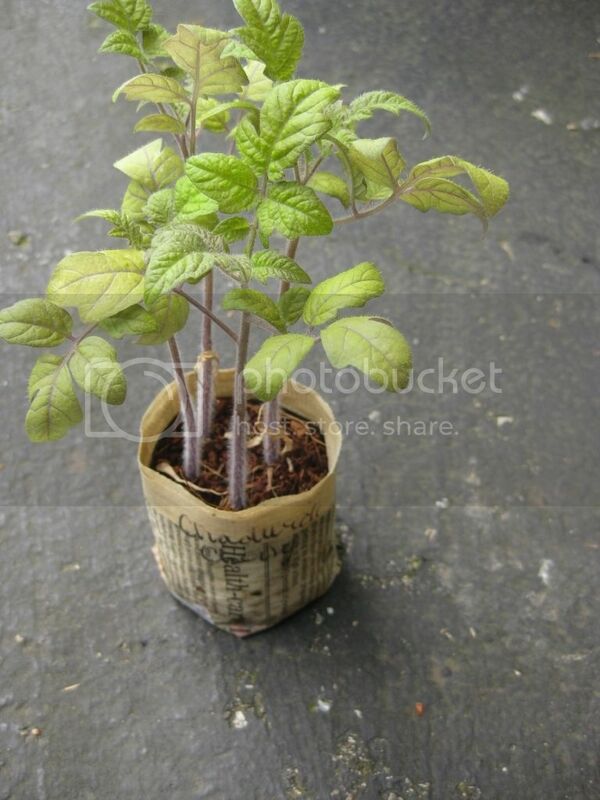 Two weeks ago I started hardening these little plants to prepare them for the big planting day. You see, seeds grown indoors have it easy...no big temperature variances, no wind, no pests (other than the occasional poke and prod from young, curious fingers), no real weather changes. 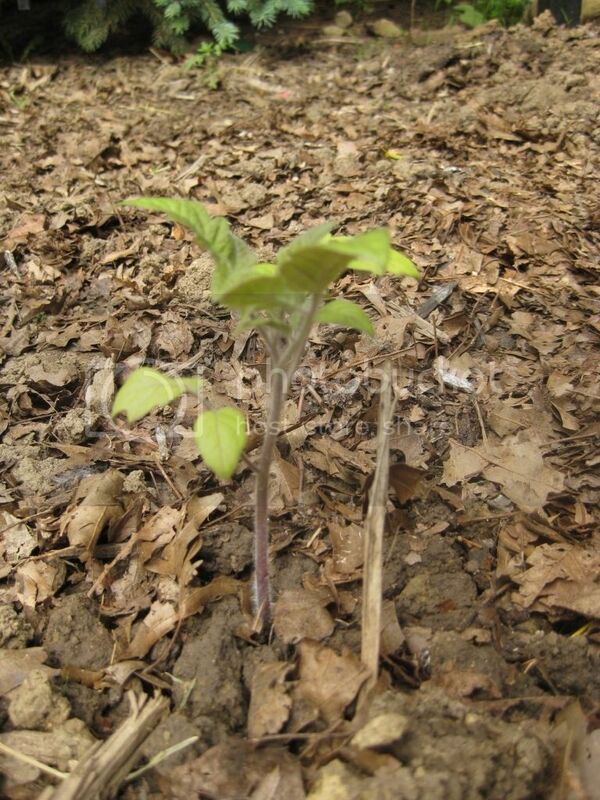 To harden seedlings, begin about two weeks prior to planting and give them short exposures to the elements. Don't put the coddled plants outside when it is 90 degrees and brutally hot or in the 40s and raining. Pick times of the day, as much as possible, that are similar to your indoor conditions. These plants have literally dozens of pea pods growing and swelling with tender sweet peas inside. I can't wait to start harvesting them soon and using them in our kitchen. Even avowed carnivores love the taste, and perhaps the look, of these black bean and rice veggie burgers. While they aren't the exact same as a Northstar Cafe Burger (that recipe is the most closely guarded secret of Columbus), it is my best attempt at mimicking the best veggie burger in town. Lastly, Happy Mother's Day to all you moms out there! Enjoy your day and know that YOU are very special to your sweet peas. How to make a crazy good glass of sweet tea. Being a mom (aka, always looking for ways to streamline things), I've come up with a way to make sweet tea in about 9 minutes flat. No special tools needed, no special skills, just easy peasy lemon squeezy, extra breezy sweet tea. First, boil the water in a microwave safe container, about 5 minutes. Remove the water from the microwave and add the tea bags. I usually use 4-5, but if you want the tea stronger, add 1 extra tea bag. Let steep 3-4 minutes, or longer if you desire. Remove the tea bags and add the sugar, stirring until it dissolves (since the water is still very hot, the sugar will dissolve quickly). *Decaffeinated Sweet Tea: Save your tea bags after they steep for your first batch of sweet tea, and make some decaf for your kiddos to enjoy. Once tea bags have steeped 1 minute, 95 of their caffeine has been removed. Or, duh, use decaffeinated tea bags. *Sweet Green (or White) Tea: Simply use green tea (or white tea) bags instead of the black tea. *Herbed Sweet Tea: Add a few sprigs of rosemary, lavender, mint, thyme or basil to your tea as it steeps. *Agave Sweet Tea: Use agave syrup instead of sugar. Growing up my dad ran a lot. He began in high school, running Cross Country. When I was young I remember many races, but it was the Columbus Marathon that he ran to qualify for the Boston Marathon, that stands out the most. I didn't fully appreciate it at the time, but my dad is a kick-booty runner. I remember my dad encouraging me to try running. My response? "I will only run if someone bad is chasing me." A couple years ago, something funny happened: I started running. For exercise and, get this, for fun. Yes, me, the non-runner. The mom to a baby and a toddler...started running. Why running? With a toddler and a baby, time to myself was, shall I say, limited? But I knew how good I felt (and how important it was to my sanity) when I got in some exercise, and running allowed me to fit in a quicker endorphin rush during my busy mommy days. On a whim, over the winter, I began looking at half-marathon training schedules. Between the crazy mild weather that afforded lots of outdoor running and perhaps a little bit of naivete, I signed up for the Capital City Half Marathon. Get this: On Saturday I ran 13.1 miles, and no one bad was chasing me. SPH, R and G after I crossed the finish line. Tears of joy and relief were fast flowing. I share this story not to brag, but to encourage. When I began running, I could run for about 3-4 minutes straight. A mile was not even possible. I am no super-athlete. 1. Never, ever, ever say "never." Or "impossible." 2. Runner's high is real. I have hardly stopped smiling since crossing the finish line. 3. I love a good challenge. 4. As a mom to young children, *you* are important and you have to take care of yourself. So I ask you: what have you wanted to do that you think you can't? Try. Just put one foot in front of the other and you might be surprised where you end up! Enjoying a little post-race bubbly, a definite race bonus. And so it's a new week and I'm enjoying the training schedule demands for the week: rest, no running, just take it easy. Want an easy way to celebrate Cinco de Mayo with your family this year? 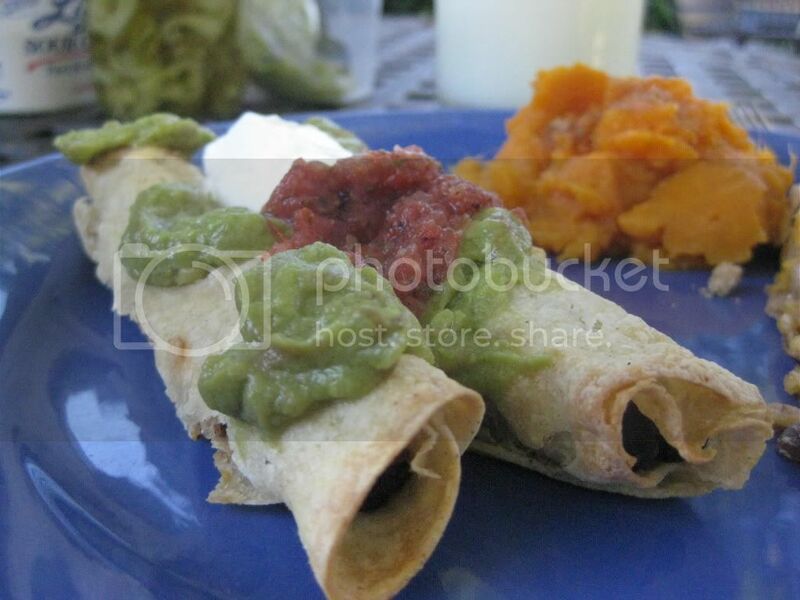 Here's my Top Ten Family-Favorite Mexican Dishes. 1. 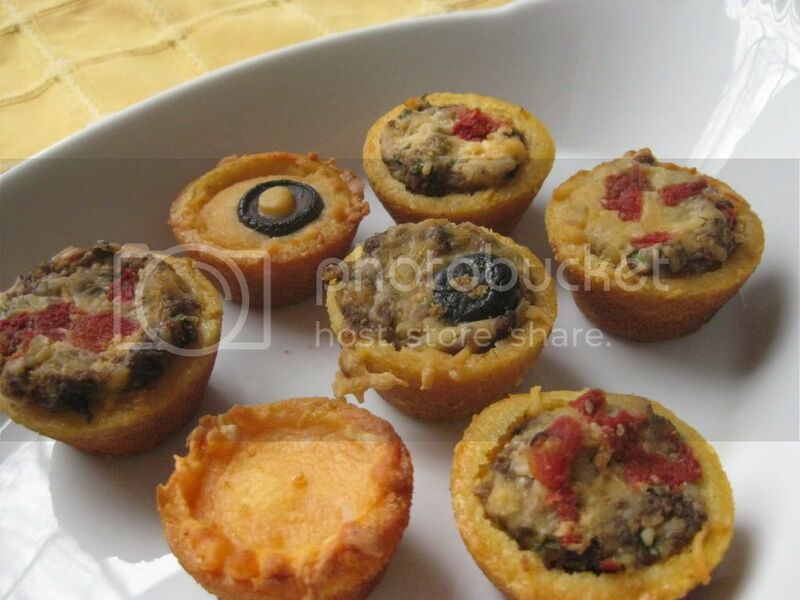 Mini-Cornbread Taco Bites: The ultimate appetizer/fun dinner/kid-friendly anytime dish. Customize these cute little taco bites to fit your family's tastes. 2. Sunshine Salsa: Make this salsa with any type of tomato you please, it doesn't require yellow tomatoes...but they do make the salsa look super sunshine-y, don't you think? 3. Enchilada Rotini: Basically, a deconstructed taco, served over pasta with enchilada sauce. A Sweet Pea family favorite. 4. Chipotle Taquitos: Oh how I love these. 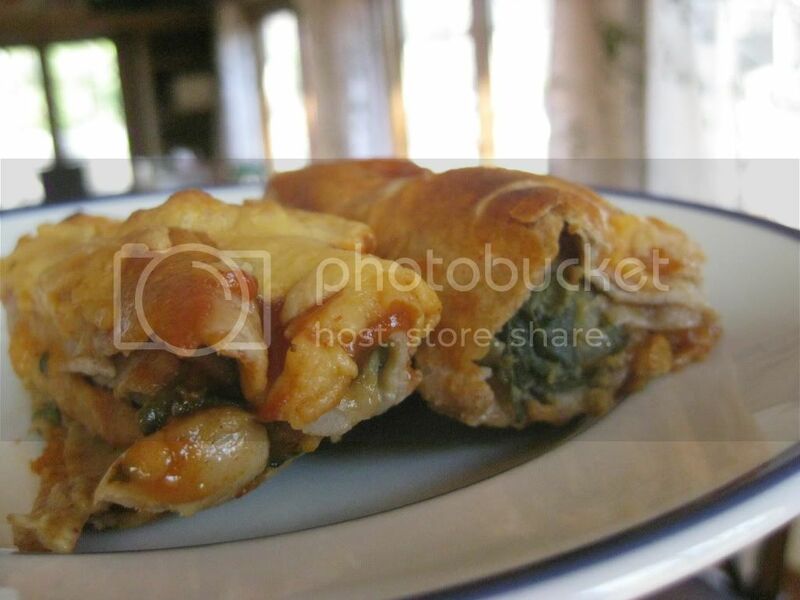 Great as an appetizer or as a lunch or light dinner. Delicious and healthy. 5. 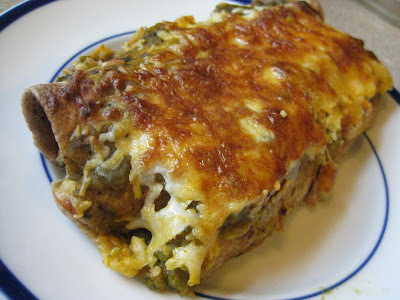 O-live Olive and Chicken Enchiladas: R's favorite enchiladas. If you have an olive-lover, they'll flip for these. 6. Apple Nachos: Ok, I admit, these are not traditional Mexican fare. But they're darn good fun with kids, and a fun twist on a Cinco de Mayo dish. 7. Taco Lasagna with Cilantro-Lime Cream: A family-friendly winner. Bonus: use the leftovers as an easy lunch. 8. 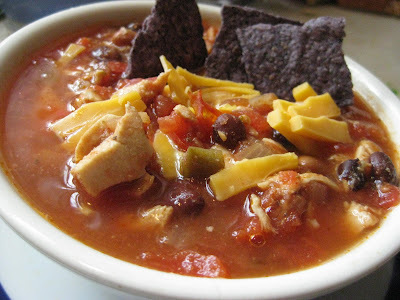 Slow Cooker Vegetarian (or Chicken) Taco Soup: May on your calendar may not scream "soup weather" to you, but this dish is so easy and a year-round favorite. 9. Taqueria Asada Tacos: Make these with either beef, chicken, pork or (my favorite) mushrooms. An authentic Mexican taco! 10. Sweet Potato Enchiladas: Last, but *definitely* not least. My favorite enchilada recipe, and amazingly, kids love these too. A real crowd pleaser. Pick one (or several!) 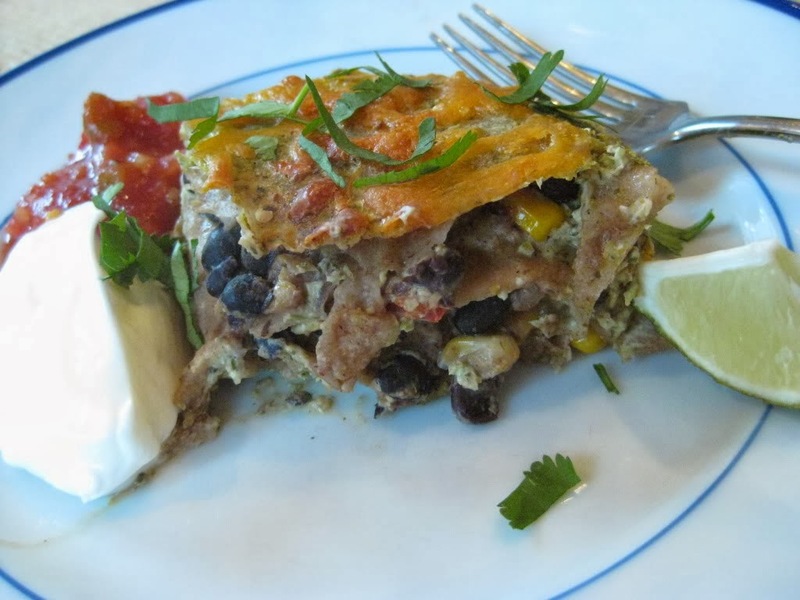 of these healthy, delicious and fun recipes for your Cinco de Mayo or anytime Mexican meal and you're family will be shouting, "ole!" Quinoa? Kale? Bell Peppers? Greek Yogurt? Ladies and Gentleman, this is one powerful one-dish meal. Tons of healthy fiber, protein, vitamins and minerals, all pleasantly combined with a bit of delicious herbed goat cheese. Inspired by a great recipe I found on one of my favorite blogs, A Pug in the Kitchen, this recipe was instant love in my bowl. Cook the quinoa: Bring 2 cups of water to a boil, add the quinoa (rinse in a colander first) and reduce to a simmer and cover. Simmer 10-15 minutes and then remove from the heat, uncover and let stand for a minute or two so the quinoa absorbs any excess water. Meanwhile, in a large skillet, heat the oil over medium high heat. Add the onion and bell pepper and saute 2-3 minutes. Add the kale and salt and stir well. Add the 1/2 cup water and let simmer for 5-10 minutes, or until the kale is wilted and the excess water is evaporated. Add the quinoa to a large bowl and combine with the sauteed kale mixture. Add the Greek Yogurt and goat cheese. Stir well to combine. This is a great alternative to a pasta salad for a light dinner or lunch. Loaded with complex carbohydrates and protein, it has loads of great nutrition for such an easy dish!